UNITED NATIONS, Feb 24 2014 (IPS) - Nobel Laureate Betty Williams started her speech to a peace forum at the U.N. headquarters Thursday with perhaps the last thing the audience would expect her to say. She urged them to stop glorifying working for peace. Williams, who received the Nobel Peace Prize in 1976 for promoting a peaceful society, believes that each person, as a global citizen, has a role to play in bringing peace to the world. “We can’t say ‘I don’t have to do it. Let them do it.’ Every child that dies in our world from conditions of malnutrition, from disease, from war, we are all guilty. As a human family, we are all guilty,” she said. The book is a collection of 30 years of annual peace proposals by Buddhist thinker Ikeda, whose recommendations for global change and for the U.N. are seen as words of wisdom by Williams and other speakers at the forum. 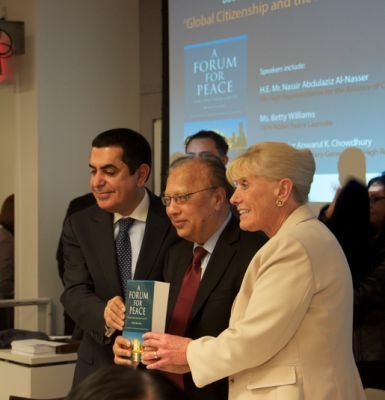 “This is the book that really needs to be read by all of us,” said Ambassador Anwarul K. Chowdhury, former under-secretary-general and high representative. “No human being in the world history has written so consistently and so substantively about the work of the U.N.,” he said, adding that many of Ikeda’s proposals, including the empowerment of women and young people in creating peace, have been reflected in the way the global body operates. Ikeda’s concept of the “Culture of Peace,” Chowdhury said, is essential to make the world a secure place for future generations, by promoting peace through dialogue and nonviolence. In his remarks sent to the forum, Ikeda said he has “repeatedly stressed the importance of fostering an awareness of our role and responsibility as global citizens,” which he considers the spiritual basis for countries to resolve conflicts and the source of hope for the future of the U.N. He then called for a brand new programme of education specifically for global citizenship to be promoted by the U.N. In 2012, U.N. Secretary-General Ban Ki-moon launched “Education First,” an initiative aiming to get every child into school, increase education quality and foster global citizenship. According to the U.N., it is not enough to only produce students who can read, write and count, but they also need to learn how to “think and act for the dignity of fellow human beings.” The problem with the current education system is that the values of peace, human rights, respect, cultural diversity and justice are not often embedded and emphasised in the ethos of schools. William Gaudelli, associate professor of social studies and education at Teachers College, said in order to have a new generation of global citizens, first it is necessary to have teachers who are more open to and more thoughtful about the world. The concept of global citizenship, he said, is not a novelty and in fact can be traced back to the ancient Greek philosopher Diogenes, who described himself as “a citizen of the world”. Gaudelli said while it may seem a “crazy” idea now to ask people who live in “neatly divided countries” to think of themselves as global citizens, the world really needs to come together to solve ongoing problems. Olivier Urbain, who edited the book, said he was impressed by Ikeda’s firm belief in the power of ordinary people and his trust in the potential of solidarity. He also noted that Ikeda’s promotion for a world without war does not stop with abolishing actual nuclear warheads, but it also deals with the mentality behind the fact that the world still have these weapons. “It’s not possible to build one’s happiness on the misery of another human being. The same thing with countries: it is not possible to build true lasting national security on the misery and terror of other countries that are so terrified by the weapon,” he said. Despite conflicts and threats around the world, Urbain said there was “a tremendous sense of hope” when he read the book. “As long as we have the space for personal creativity and solidarity, there is nothing that human beings cannot overcome,” he said. Urbain said the U.N., therefore, needs to create channels and mechanisms for people’s voices to be heard and, in so doing, let itself be empowered by the people. Nassir Abdulaziz Al-Nasser, High Representative for the U.N. Alliance of Civilizations, said the peaceful and prosperous co-existence of peoples and nations is the cornerstone of the U.N. mission. “We are bound together as the international community in the belief that despite different cultures, languages and religions, there are fundamental shared values and principles that underpin our humanity,” he said. “We are bound together as the U.N. family because we recognise that it is through the celebration of our diversity, as well as through the promotion of tolerance and dispelling fears of the “other”, that we will build a more peaceful world,” he told the forum. Even though it was clear that many speakers were believers in the U.N., they did not shy away from the fact that the global organisation is not perfect. That is why reforms and recommendations proposed by thinkers like Ikeda are important, they said. “What could we do if we didn’t have this organisation? How much worse would it be?” she asked.